As if Matthew wasn't enough to keep meteorologists busy today, we also have a rather significant tornado threat. Let's break things down. The map shows the probability of a tornado within 25 mi. of any given point. I have added cities to make it easier to orient yourself. Five percent (brown) is what I call the significant threshold and it roughly corresponds to a high enough probability to warrant a tornado watch. 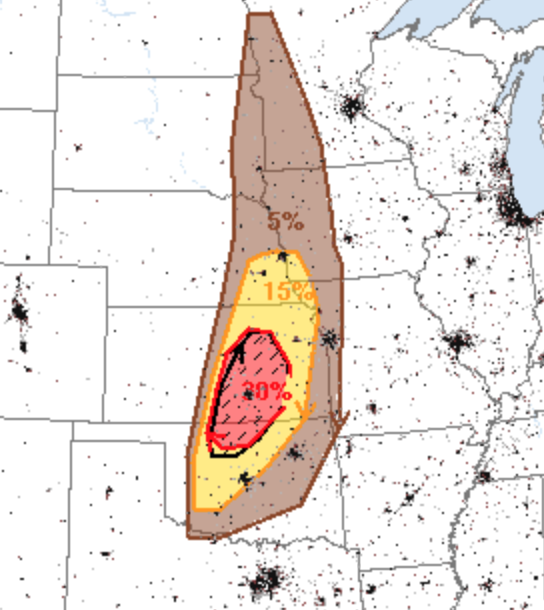 Ten percent (yellow) tell us that there is a pretty good chance of one or more tornadoes in that area. It includes Wichita. Winfield, Ponca City and Enid. The brown area includes Manhattan and Salina and extends south to near Edmond. Have at least two sources to receive any warnings. Make sure batteries are fresh or newly charged. Make sure any infirm relatives or friends are aware of the threat and can take shelter. If the sky begins to darken or you hear thunder, start monitoring the weather closely. Wear shoes into shelter. If your home is hit, you do not want to walk through debris barefoot or in flip-flops. If you are in Wichita, all public schools have safe-room tornado shelters. Do not make a dash to the school while the sirens are sounding. Your children will be fine. Take care of yourself at that point. Have any keepsakes or other valuables near the shelter entrance so you can grab them quickly if a warning is issued. There is also a risk of very large hail. The significant threshold for 1" hail is the yellow. 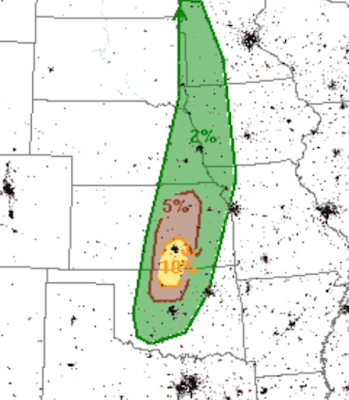 In the hatched red area, there is a relatively high chance of hail 2" or larger (hatched). Bring your car inside. I will update this forecast early this afternoon.